Today I opened a new position in ATCO group (ACO.X). I bought 50 shares at 47.65$ for a total purchase of 2 382,50$. This isn't a big buy, but it's no chump change either. I had ATCO in my target list for a while. I thought the price was decent after a little fallout of roughly 15% from its year's peak. So I made a move. This will add 49.50$ to my yearly dividend income, which now stands at 2 927.84$ (you can check it out here). ATCO is now my 17th company. I know, I know... I wanted to limit myself to 12-15. You are absolutely right. But I couldn't find good market prices to add shares to my actual holdings. The other thing that bothered me is that of some of my portfolio' sectors were under represented (if not missing), such as the Telecom. Hence, the arrival of BCE (BCE) and Verizon (VZ). I did also add some Alimentation Couche-Tard (ATD.B) for the Consumer sector. Founded in true entrepreneurial spirit in 1947, ATCO has grown from its Alberta roots into a worldwide group of companies with more than 9,000 employees and assets of approximately $18 billion. Atco operates mainly in Alberta and in the North of Canada, but also abroad in Australia. The balance sheet of the company is solid. As of March 31, 2014, the company had access to 616 million, which is a decent amount of cash. According to the 2013 Financial Summary, the total debt of the company represents roughly half of the company's financial capitalization. They have also recently hiked their dividend, which now stands at 0.99$ a share, that represents a 2,8% yield. 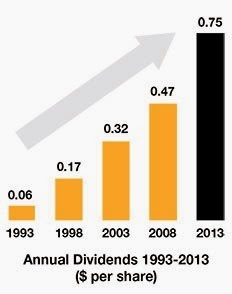 They have a great history of dividend increases as shown in the graphic below. All in all, I'm pretty happy to have initiated a position in this company. I am not intimately familiar with their business and their books, but ive seen its name pop up when researching pipelines. I realize that ATCO is the parent company and has its fingers in lots of pies including utilities. Thats another sector under-represented in my portfolio, so I will have to take a close look at it. Thanks for bringing it to my attention. Looks very diverse set of businesses and also like hte fact that its geographically diversified. Will definitely look into it. Hey R2R. I'm actually quite surprised to see this company not more represented among our little crowd of bloggers-investors. I've been following Atco for a couple of years now. I heard about it through a Financial Letters I was then a subscriber. All in a, I reckon the price is cheaper at the moment than most of its peers. Hey DB, I know! It's like a little secret gem. ;-) Don't tell everyone. I will buy some more if it goes below 42$ I like this stock a lot. Thanks for the good words.